Building on the incredible success of*Rifts® for Savage Worlds*comes three new Worldbooks further detailing the factions, locations, and threats of Rifts® North America. Inside you’ll find new allies, armaments, and abilities to aid Tomorrow Legionnaires in their fight against the evils of the Megaverse®. *Arcana & Mysticism:**Explores the Federation of Magic, Psyscape, and Techno-Wizard enclaves throughout North America, and the dire threats hiding within. *Blood & Banes:*Details the struggle of dark heroes against the alien Xiticix Hivelands, encroaching Vampire Kingdoms, mysterious Dinosaur Swamp, and insanity of Madhaven. *Empires of Humanity:**Brings to life the wonders of human civilization from the Coalition States to the New West, and uncovers the secrets of the east coast. 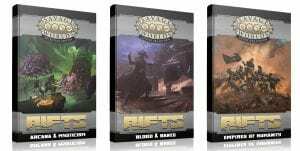 Best of all, not only can you get these*three NEW Worldbooks for Rifts®,*we’re also printing*revised and updated versions*of the original core Rifts® for Savage Worlds books (The Tomorrow Legion Player’s Guide, Game Master’s Handbook, and Savage Foes of North America) and making it easy for you to upgrade as well! These deals are*only available during this Kickstarter and pledge manager. *After that they’ll be listed at their full retail price.